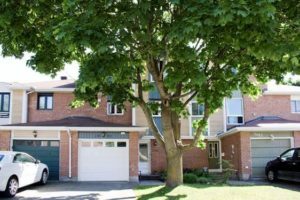 Amazing 3 bedroom, 1.5 bathroom, spacious 3 storey rowhouse in the desirable Fallingbrook area of Orleans! This home has recently been thoroughly and very tastefully completely updated. In the kitchen there are 4 foot drawers for lots of storage, a unique breakfast bar, it is an open concept kitchen/living space, there are under cabinet and under bar LED lighting, it’s eat-in kitchen, also potlights, tiled floors and a simply stunning backsplash. The second and third floors have 5/8 solid maple floors with custom made inset vents. The fireplace has a modern hearth, tile surround, a custom mantel with integrated LED (multi colour) lighting. The master bedroom has big walk in closet with cheater access to the main bath. All the big ticket items in this home are done: furnace (2009), roof (2006), driveway (2013), front walkway (2012), front (beauty!) and back door (2017) and the windows (2015). The backyard is amazing with a big shed, tons of gardens and a big deck just off of the Family Room. It is in a great location, on a very quiet street, nearby schools, all amenities, with close access to buses and the 174 on ramp.